Now that we have entered our 30s, we thought it was time for a suitably grown-up yet wide-eyed subject for this precarious moment. And what better place to look than this most ancient genre of the fine arts that is painting – in fact, an area that we have not addressed this far. 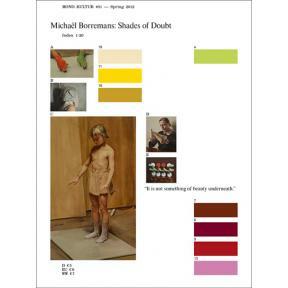 When Belgian artist Michaël Borremans first presented his paintings to the world at the tender age of 37, he immediately caused a stir in the art scene. His realistic yet mysterious figurative images subtly draw one to the centre of a question which remains permanently unspoken. Through the combination of his immaculate painting techniques, using muted tones and classic compositions, and the puzzling scenarios that are at the heart of his work, the artist brings together both: melancholy and humour. With mono.kultur, Michaël Borremans talked about the mystery at the heart of painting and life in general, his commission for the Belgian Queen, and why he needs to wear his Sunday suit when he goes to work. The issue features a whopping 20 plates of Michaël Borremans' paintings, all printed in lifesize scale, allowing you to examine the technical mastery behind his work in breathtaking detail.